The focus of our food philosophy is on prioritizing vegetables and fruit over other food groups, and making sure that we are feeding our bodies nutrient rich food. Living in the eternal heat that is Singapore has resulted in us eating a lot of salads, and having a salad for lunch is a great kick starter for the amount of vegetables that we are eating in a day. This salad has become one of our favourites. Using both rucola and baby spinach leaves adds some interest to the lettuce base, while the beans or asparagus add a little more substance to the meal. The sesame seeds finish it off attractively, while also adding essential nutrients. You could also consider adding pumpkin seeds, sunflower seeds or pine nuts to the garnish, especially if you remove the parma ham to make it a vegetarian or vegan salad. Cook the beans or asparagus in a pot of boiling water that is lightly salted for 2-5 minutes until only just cooked. Remove from the pot and quickly wash under running water to cool them down and prevent further cooking. Combine the sea salt, black pepper, olive oil and vinegar in a glass and stir well to combine. Pour the vinaigrette over the salad, and toss the leaves to coat them all. 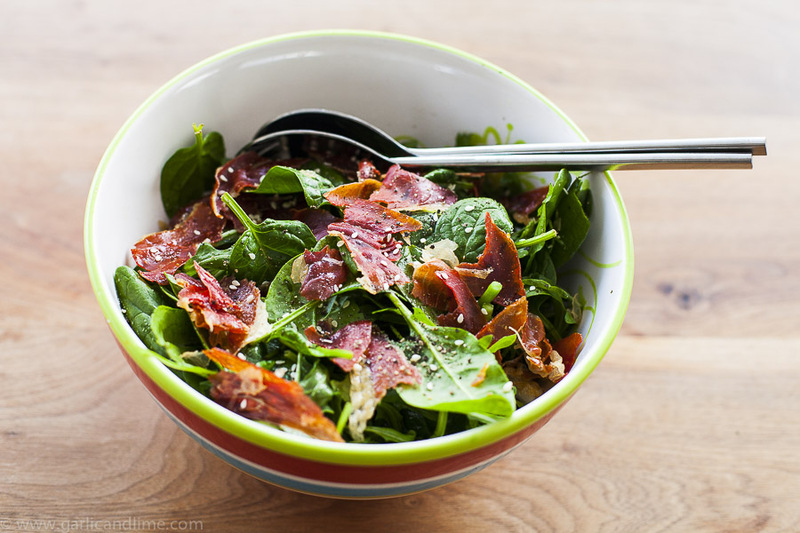 Spread the crispy parma ham over the salad, and top with a sprinkling of the sesame seeds to garnish.